The capital city of the Republic of Ireland is one of the great cities in Europe. It's a wonderful place to visit anyway, and for the tastes of the dark tourist there a few sites well worth seeking out as well. Apart from that, the General Post Office also holds a loose dark connection, namely to the Easter Rising of 1916 – see under Ireland. You can see bullet holes and bits chipped off the main columns at the front that are lasting signs of the fighting for this landmark building in the English crushing of the Rising. A bit further south at the bottom of O'Connell Street by the head of O'Connell Bridge take a closer look at the O'Connell Monument. The man himself at the top (the "Great Liberator" – who had made his name in the first half of the 19th century as a campaigner for the rights of Catholics) is less interesting here – instead look at the female figure at the foot of his column at the north-east corner of the pedestal. The hole you see in her breast is also a bullet hole from the Easter Rising fighting! Dublin has its own tourist attraction that picks up the grim legacy of the Great Famine (see under Ireland), namely the "Jeanie Johnston" – a replica of one of the so-called "coffin ships" that transported emigrants across the Atlantic to their new homes in America. The Jeanie Johnston herself wasn't actually so bad – nobody on her 16 or so emigration voyages actually died. 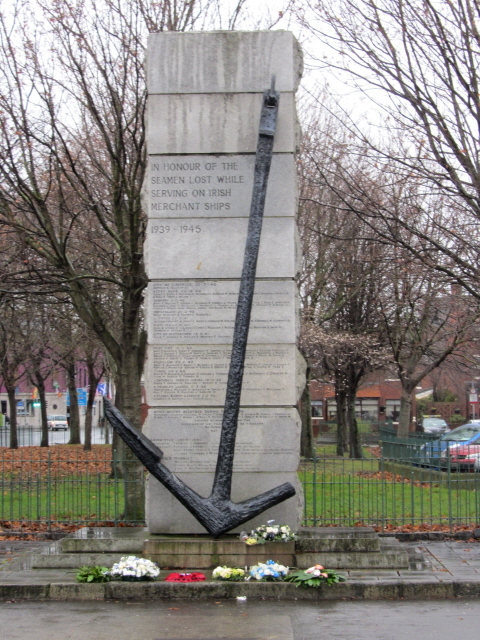 But it's still a kind of a symbol for the plight of the starvation-threatened emigrants' plight. The boat is only a copy but inside, accessible by guided tour, they have tried to replicate the atmosphere of hungry emigrants under deck by means of dummies in period costume lying in bunk beds or standing/sitting around, one even grumpily wolfing down a plate of spuds! They're not terribly realistic, and the whole scene doesn't look half as gruesome as you might expect (nor does it even look especially crowded). Maybe that's because a large part of the museum ship's clientele are young schoolchildren … (open daily with tours starting on the hour from 10 a.m. in high season, 11 a.m. in winter; last tour 4 p.m., 3 p.m. in winter; cost: 8.50 EUR adults, 7.50 seniors/students, 4.50 children). 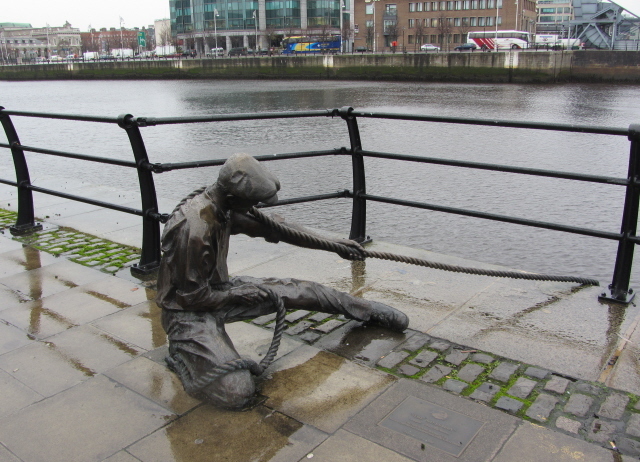 Not far from the Jeanie Johnston, some 300 yards towards the city centre, look out for a group of statues on the north quay of the Liffey: these form Dublin's starkest Famine Memorial. The ensemble consists of six adult figures and one dog cast in bronze. One of the adults carries over his shoulders a small, listless child, most of the others clutch small bags to their chests, except one particularly miserable looking young woman whose arms are simply dangling down as if all strength has long gone out of them. All are wearing tattered rags and their facial expressions truly convey utter desperation. It's really one of the most moving ensembles of human sculptures I have ever encountered anywhere. Bronze plaques set into the cobbled ground around the figures specify the names of donors to an associated charity, with names ranging from total unknowns (to me at least) to highly prominent dignitaries including actors, footballers, ministers and even heads of state from Canada and the USA (both the Clintons were here, apparently). One final point of dark interest is of a very different kind – that of actual dead on display. The crypt of St Michan's, an ancient small parish church to the north of the Liffey near the Four Courts, contains such a gruesome secret … although not quite such a secret any longer (you can find numerous images and references online). Amongst the coffins down in these dark dank vaults are four without lids, revealing some relatively well-preserved mummies. Naturally preserved mummies that is, not intentionally treated for controlled mummification like the famous Egyptian or Andean mummies. Here it must have been the dry air, maybe tanning effects from the water table on which the crypt sits, or other such phenomena (it's not entirely clear) that prevented the normal deterioration of the bodies. The faces and rib cages are covered in leathery skin. The hand of one of the men, known as the "Crusader", sticks slightly up – and in the past visitors were allowed (even encouraged) to shake that hand (because of a superstition that that would bring good luck), but no longer. Legend has it that Bram Stoker visited this crypt as a young man … so maybe it provided some early inspiration for his later forays into the fantastically morbid in his Dracula novel. Who knows. The crypt is officially only visitable on guided tours, which take place between 10 a.m. and 12:45 p.m. on Saturdays and at weekdays also from 2 to 4:45 p.m. in summer, but only between 12:30 and 3:30 p.m. in winter, no tours on Sundays; fee: 5 EUR). Location(s): in the middle of the east coast of Ireland, ca. 65 miles (110 km) west of Holyhead in North Wales, Great Britain, and ca. 100 miles (150 km) south of Belfast, Northern Ireland. Access and costs: easy to get to, at least by air; rather expensive. Details: Thanks to Dublin's international airport it is quite easy to get to the city by plane from a wide variety of departure points in Europe as well as America. Connections to the UK are particularly plentiful, including low-cost airlines. Overland access is, naturally, restricted to the routes to/from Northern Ireland. Dublin has plenty of affordable bus connections to a number of places there, including, of course, the cities of Belfast and Derry/Londonderry. The former can also reached by slightly faster trains, which however also cost significantly more (double, unless booked well in advance). Getting to Dublin by sea is also possible by means of the passenger/car ferry services to Liverpool in northern England and Holyhead in North Wales. Once in Dublin, getting around is fairly easy, thanks to a good bus network as well as trams and metro-like fast trains. The city centre is perfectly walkable, but to get out to sites such as Kilmainham Gaol you will most likely want to use public transport. Accommodation options in the city are plentiful and varied, ranging from hostels and B&Bs to upscale hotels at top-range prices. But even for fairly simple guesthouses or B&Bs that are in good locations prices can already be quite steep. To get better deals look for options north of the River Liffey and/or in the suburbs. In the summer it can get difficult to find a place to stay, so booking in advance is recommended at such peak times. For food & drink, Dublin boasts a huge range of quality right up to the very top ends of international culinary standards. But it often comes at a price. Cheap grub is of course available too, but it's worth spending a little more. And that's not just for Irish fare. For instance I had one of the very best Indian meals in my entire life in Dublin (at the Jaipur) when I was there in December 2012 (and my standards with regard to curry are extremely high after several years of living in Great Britain's curry capital Bradford!). And as for drinking: Dublin's pubs are legendary, and often rightly so – see below. If you want a break from Ireland's ubiquitous standard stouts, the good news is that the microbrew/craft beer trend has made its inroads into Dublin too. Time required: a few days are the minimum. To see just the specific places pointed out above, as little as two days may suffice easily, but Dublin as a whole is surely worth longer than that. Combinations with other dark destinations: See in general under Ireland … and also under Northern Ireland – both Belfast and Derry/Londonderry are just a few hours away by car or bus (or in the case of Belfast alternatively by train too). Combinations with non-dark destinations: There's so much, it's impossible to even attempt a halfway exhaustive lists of all those museums, parks, and what have you that Dublin proudly sports … so I won't. I'll rather leave that to the traditional guidebooks and other such resources. Here I'll just pick out a couple of (not quite) random items. The Irish pub is a famed institution – but don't think you know what they're like from all those globally standardized copies you get in almost every corner of the world these days. The real thing, and especially here in Dublin, is indeed something else. The range is huge and doing your homework before you arrive really pays off. You can chose between more and less traditional, more emphasis on music or less, and more traditional or more modernized music. But music is a hugely important part of the Dublin pub experience in countless cases. Few places in the world are as rewarding territory for a pub crawl as Dublin. Sampling a good selection of the best is almost an obligatory exercise here. Drinking can get rowdy on weekends, but it's really not all just about the booze but an important part of Irish culture per se. Drinks-wise the quality varies, but some familiar names are as good as unavoidable. Speaking of names of drinks … Two of the more specific attractions for mainstream tourism in Dublin are difficult to even mention without involuntarily advertising already well-established brand names. I'll try to do without dropping those names. One is the place where probably the world's best-known stout (a black beer) is from, or at least that brewed in Ireland itself (some say it's better here than any of the licence-produced variants abroad). Its "home" in Ireland's capital is a vast facility, and one older part of the complex houses a big shiny visitor centre that draws in masses of tourists. The other is a certain ex-distillery where a certain well-known brand of Irish whiskey used to be made. 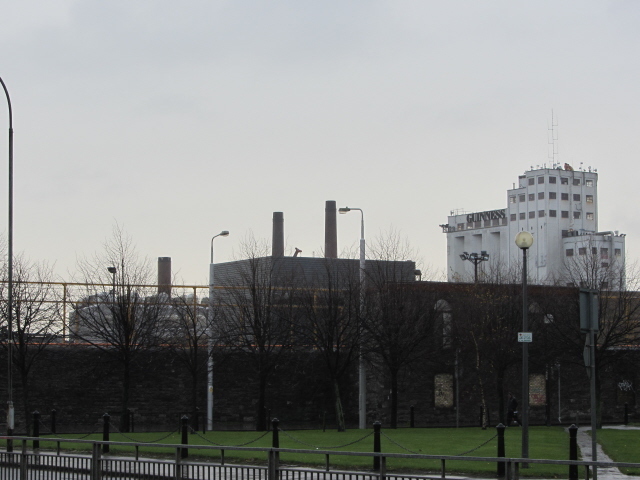 Now almost all Irish whiskey is produced in a huge modern factory near Cork (Midleton). Since that sort of facility would not exude the romanticism that the marketing departments of the whiskey industry favour, the long-closed down distillery on Bow Street in Dublin was converted into the museum it is today (although I wonder how many visitors miss that little point that it is no longer an active distillery). I did go on one of their heavily booked tours and can say that it was entertaining, for sure, but also heavily slanted, to say the least. Of course you'd expect marketing propaganda to be the main goal here, but it was still a bit painful to witness how the uninitiated amongst the tourists were misled into all manner of false beliefs about whisky in general, and about Irish whiskey's main competitors in particular (especially Scotland and the USA). It was almost an exercise in brainwashing everybody into believing that this particular Irish whiskey is indisputably the best in the world. It is admittedly a much improved brand – but hardly in the same super league as some top-level single malts. Never mind. As sheer entertainment the tour was very enjoyable. Needless to say, Dublin is also a perfect starting (as well as end) point for any longer explorations of Ireland that goes beyond the confines of a city.